Miniclip’s – and, dare we say – the world’s, most popular free online Baseball game. 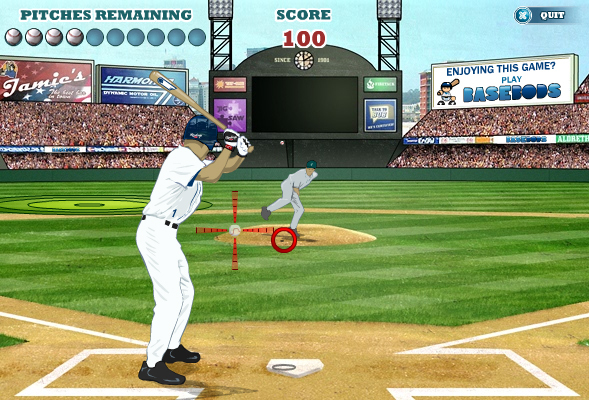 With naturalistic rotoscoped animation and an addictive arcade mode where you’ve got to land the ball in the centre of a target, the game distills the best of Baseball into easily enjoyed bouts of fun. One of the biggest challenges was making the swinging mechanic ‘feel’ right, and it’s something which we spent a lot of time playtesting and refining. The end result allows you to scoop, slice and hook the ball pretty much anywhere you’d like in the field, and the best players can land it on a nickel. Combined with realistic sound effects – crunches when you mis-time a stroke, and pleasing thwacks when you’ve middled the ball – it makes for a uniquely intuitive experience. We also loved creating the details – rotoscoping the little sway of the bat as the batter waits, the umpire’s swinging their arms to signal ‘safe’, and composing the organ stings which echo round the stadium as the tension mounts.